A while ago I posted about making a homemade soroban for my kids out of a Melissa & Doug abacus. The bead size of a traditional abacus was just too small to be truly effective for my son, age 3. My daughter did alright with a small abacus, but in general bigger is still better with my kids while they are young. It makes the learning more "obvious." I thought the adapted Melissa and Doug abacus would be sufficient but the design didn't turn out as well I planned, I unknowingly cut the rods too short. Whenever my overzealous son manipulated the beads, he used too much force and the beads would bounce back instead of effectively staying in place against the answer bar. Darn it. We started out by using my iphone to teach the kids to count to 100 on the soroban using the Talking Abacus app. They have it for the ipad as well. It worked out beautifully because the kids were able to learn without me standing over their shoulder and I could easily hear how they were doing nearby. They already knew how to count to 100 from memory, so the app provided immediate feedback. It announces each number when they set the beads. My daughter self initiated some skip counting practice on it, as well. After they learned to count to 100, we then began the Abacus Adventure app (ipad only) which parents on the BrillKids early learning forum had highly recommended. It was an immediate hit! The kids loved the idea of saving the princess level by level and were motivated to play it. 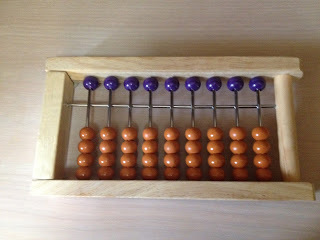 I can actually hear my son on the couch playing Abacus Adventure as I type this, although we do it together most often. :) Overall, I am really pleased with it and it's finally allowed use to make some progress in this subject. It's a little buggy and does freeze up from time to time when the kids get "scroll happy" going up and down too quickly, but they know not to do that now for the most part. If it happens, we have to reboot the machine and it works fine again. There are a couple of hurdles we needed to get over for my kids to be successful with this. One of them is the Mental Math visualization levels. They are starting to learn soroban relatively young and while they are picking it up nicely, they are still working on their visualization skills. They are not yet able to solve all of the problems in their head, which makes the mental math levels a challenge. Not being able to advance through these levels would which greatly dampen their interest until their visualization skills caught up with them. I feared with that kind of stall, they would lose momentum and motivation with it. So to get around that, we utilize the pause button to solve the problem on a physical abacus (with more time and Mom's help if needed), then resume play and enter the answer. We fit in their visualization practice at other times. However, as I mentioned our homemade abacus wasn't working out too well, and my daughter's cheapie ebay $5 special was too small for my son to enjoy. It's okay, but it fell apart the very first day, no joke! LOL We had to pick up every single bead and reassemble it with packing tape. At the time when I bought it, I wasn't sure how this was going to go so I didn't want to put out a lot of cash. I liked how the longer rods gave her more room to work, but the edges of the beads are not smooth and it's just very lightweight. It's closer to junk that quality merchandise but it will get the job done for an absolute novice. If I hadn't ordered the new one, I would have chopped the base in half so it layed flat, removed some of the rods (which can be done by wiggling then in a circular motion, and bought a piece of wood to attach for the answer bar. But, I was ready to invest the money and be done with it, and I am very glad I did. And man this thing is BEAUTIFUL! The craftsmanship is just spectacular, I was just in awe after I really sat down to inspect it. At $163, it was much more than I wanted to spend, but it is very high quality. The kids LOVE IT! And I do too. :) Already it's got some minor dings in it here and there from being knocked in the fireplace, etc, but I would rather it be loved and used by my kids then pristine in the closet. I added some adhesive felt circles to the bottom and back to protect it as much as possible. I love that I can stand it up and show both kids at once, but the kids need to lay it down so they don't knock it over. I don't think this is going to help them develop speed by any means, but it is absolutely better for my kids to manipulate at this stage. My daughter could have gotten by without it, but my son is just taking off and I think even passing her now in enthusiasm and skill at the moment. My only regret is not buying it sooner! It took about 7-10 days to arrive from Tomoe Soroban in Japan and the customer service is excellent. They responded to my question over email quickly. When the kids are ready for an abacus with more rods, I will not hesitate to order from them again. I believe this was the company recommended by SorobanTom, as well. We have been dabbling in the Nurture Minds workbook but it's a bit slow and my kids are so techy, they seem to prefer the ipad. I am still kicking around getting some instructional videos to help reinforce concepts, we'll see. Math Genie offers addition and subtraction now, but will release multiplication and division in the next 3-6 months. They were very nice on the phone and said if you get stuck, just email them for coaching/questions as you go. They recommend one lesson a day. We still use Math Secret off and on (and I do intend for the kids to work through the curriculum one day independently, even if it's review at that point) but for the moment our current approach is working well. If imitation is the greatest form of flattery, well, consider yourself flattered. I'm always copying you. :) I've been ho-humming about abacus for too long- we're going to get one too. When you talked about getting an abacus on BrillKids, aangeles talked about the teacher's abacus being difficult for children to move. I'm guessing that's not the case with this one. Is that why you went with this company instead of the one in India? I really enjoyed reading your article about the steps you and your children are taking to learn the Soroban. My name is Jody Weissler and I run a site called http://Japanmath.com that is focused on mathematical techniques from Japan including the soroban. I too have made sorobans and have a video on my site etc showing Sorobans similar, but different from yours. I should also tell you taht a recent book called Aba-Conundrums came packed with a pretty good Soroban for children. It is the red soroban pictured on the JapanMath twitter feed. @Tamsyn- I ended up going with this company because they were recommended by Soroban Tom and they seemed very high quality. I probably could have gone either way and it would have been fine. @TeachTopia- I looked at that one as well but for whatever reason, I was really drawn to the traditional biconal beads. I think it's a great option though! Thanks for pointing it out to other readers. Oh, and the beads are not that difficult to move. It takes a *little* more force I guess, but it hasn't been an issue for us. I actually emailed them that exact question before buying it and they said it probably wouldn't pose an issue. What size abacus is your daughter working with in the photo? Students should learn English in their earlier ages as foundation to get English at the next level of education. Thanks for the post, I think that your perspective is deep, its just well thought out and really fantastic to see someone who knows how to put these thoughts down so well. I was just wondering how are you and you beautiful children doing. Do you still continue education with your children? I would love to see more posts of yours. Nice Post,Thanks for sharing some useful topics in Abacus. Its very useful information about Abacus.Mental Maths Game is helpful children. I found the same problem with the soroban and toddlers. We ended up buying Aba- Conundrums just for the little abacus it came with. It isn't as nice as the one from Japan, but is the right size and price :). The kids of today Future of the next day. we need to provide them fantastic information for there knowledge improvements. We have an important task, make our children happy. Spent more time together, do something, and create a family hobby or traditions. But our problem is a lack of time for this. In this case we can let freelancehouse.co.uk, and forget about tasks for a while. Just relax. Hi, its been a LONG time since you've posted on your blog, or at BrillKids. Will you please share an update of your kids progress soon? Great !! Children love to learn by understanding stories and games. It is very nice to engage them on the activities they enjoying the most while learning. I would like to suggest our online Japanese course Yomuzoku ( https://www.yomuzoku.com/ ). It is an online tool where easy to understand stories are shared by us on daily basis with Japanese pronunciation. I loved this article a lot. I was thinking to enroll my kid for abacus course, this article helped me to understand abacus. I thought to enroll my kid to aloha abacus course can you help me to know where it is right ot not? Got to know about Japanese Abacus. Thank you. Which one is better for learning Japanese or Chinese? The world very well knows about Chinese Abacus. Thanks for sharing about Japanese Abacus. Very interesting. I like this blog and I will look forward to reading more stuff. We have an educational website and popular kids songs to help kids and their parents to find out activities that helps in their overall growth. Great Information. It helps a lot to children's. Abacus helps to improve mental math calculation which further leads to the enhancement of calculating speed. Have your account hacked?? Have you deal with hacked account issues and want to resolve it immediately with best possible solutions? If you are dealing with nay complex issue and are unable to fix it on your own then you can immediately convey your query to the professionals who are there to fix your problem and are available via Binance support number 1-800-665-6722. You can trust the professionals as they are skilled in dealing with all kind of issues instantly.